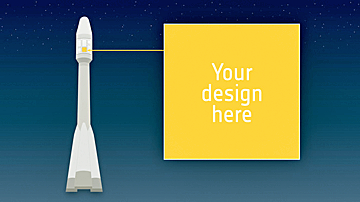 ESA is offering graphic designers and artists a unique opportunity to feature their work on the rocket carrying the Cheops satellite. As indicated in this image, the design will be displayed on the fairing of the Soyuz rocket carrying Cheops. The fairing is the outer housing that protects the satellite against the extreme pressure and heat experienced as it punches through Earth’s atmosphere. will be 1 x 1 m.
The design will be placed on the Soyuz rocket’s fairing, the tough outer shell that protects the satellite during launch and as it passes through the atmosphere into space. At an altitude of about 100 km, the fairing will be jettisoned and fall back to Earth, while Cheops will continue into orbit. Cheops, a partnership between ESA and Switzerland, will observe bright stars known to host planets. Scientists will use high-precision monitoring of a star’s brightness to examine the transit of a planet as it passes briefly across the bright face.The information will help to reveal the structure of planets circling other stars, especially those in the Earth-to-Neptune mass range. The mission will also contribute to our understanding of how planets change orbits during their formation and evolution. Cheops is currently on track to be ready for launch by the end of 2018. Artist impression of the CHaracterising ExOPlanet Satellite, Cheops. Image is courtesy of ESA–C.Carreau. This competition is an exciting opportunity for students of graphic art or design, or early career graphic artists and designers to make one of their designs a part of ESA history. For the winner, the design will be visible during launch preparations and liftoff, as well as on photographs and video footage taken at the spaceport in Kourou, French Guiana. 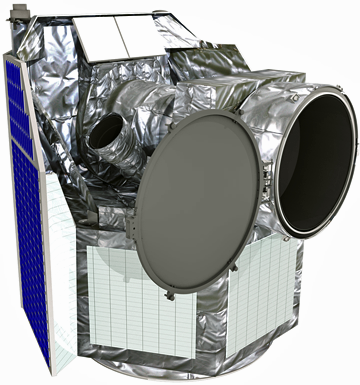 In addition, the winner will be invited to attend the main Cheops launch event in Europe as a guest of ESA and to watch as their design climbs skywards. Designs selected as runners-up will be exhibited during the event, which will be broadcast through multiple media channels. Read more about Cheops on the dedicated ESA webpages and on the mission webpages from the University of Bern. The deadline for submissions is 17:00 GMT (18:00 CET) on January 31, 2018.